When is Cornerstone announcing? I heard it was meant to be tonday but I've heard nothing about it at all on the news and seen nothing on the WWW. They're meeting at 6.30pm Dan. It is not clear if they will declare immediately after the meeting or whether they'll wait. So, Ancram and Milton declare for Cameron. That doesn't surprise me. Are the others going to follow Rifkind and endorse Clarke, do you think? That Davis list has a lot of ex-Ken supporters and former Portillistas. Davis supporters beware! Ancram declares for Cameron and makes his Cornerstone suitors look rather foolish! Tomorrow (Wednesday) the 92 Group and No Turning Back Group are holding a hustings that the Cornerstoners are planning to attend. Cornerstone have another meeting planned for tomorrow after the hustings, so that's when they're more likely to announce a decision. Rob Wilson MP (Reading East) is holding a public meeting on Friday night to which all leadership contenders have been invited to send a representative. 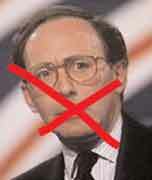 Nick Robinson of the BBC will be there along with Sky and ITV. It has been widely publicised in the local press and non party members are welcome to attend as long as they live in the constituency. Sir Patrick Cormack has followed Rifkind and declared for Ken Clarke. The Telegraph reports that Theresa May will probably declare for David Cameron today. She just has, Alastair; on the Today programme. Article on today's Independent stating that Sir Patrick Cormack is backing Ken. Does anyone know what happens if there is a tie for third and fourth place? That is a real possibility that needs to be discussed. The obvious options are a a casting vote for 1922 Chairman or reballot or both eliminated? In 2001 Sir Michael Spicer reran the first ballot after David Davis and Michael Ancram tied for last place. sir Malcolm's campaign team had claimed to have more than just the six public backers, and had somewhere between 10-20 supporters. If that is true they might well prove very significant in this contest. Does anyone know how many members of cornerstone have mot declared? Of the 25 MPs on Cornerstone's website, 9 have declared so far - 5 for Fox: (Burrowes, Swayne, Harper, Hayes, Crabb), 3 for Davis: (Liddell-Grainger, Brazier, Scott), and 1 for Cameron: (Mundell). So there are 16 still to declare. I'm not a huge fan of Bernard Jenkin but it is encouraging that the breadth and variety of support for Cameron has increased considerably. BBC News website reporting 15 more MPs declaring for Fox. No names yet. Where abouts on the BBC site? I cant see it anywhere. On the "Latest News" strip, running along the top. Well Iain, at least he's broadening his appeal beyond the Old Etonian brigade. I hear 'Dave and Sam', as we must call them now, are inviting would be supporters over to their Notting Hill pad for lasagne and chianti. Seems like a good idea, everyone knows Tory MPs love getting their greedy little snouts in the trough. Both the telegraph and the independent reported today that sir Patrick Cormack had endorsed clarke. He doesn't appear on this sites list though, Is it just a rumour rather than a firm pledge? Ed: I have a sneaking suspicion that your site is being attacked by some unscrupulous bloggers that aren't very Conservative.